At midnight, one day in my third year of veterinary school, I found myself in the Intensive Care Unit of the Veterinary teaching hospital. My dog had explosive vomiting and diarrhea all evening. I watched him become lifeless in just a few hours after the symptoms began despite the hours on fluids and life support. Our “Mo” was one of the first victims of a new disease that would later be discovered as parvovirus. Now vaccines are available and millions of dogs have been spared Mo’s fate. When I attended grammar school in the 1950’s there was at least one kid in all of my classes who wore braces due to polio. I would spend many days after school playing at a friend’s house whose dad was in an iron lung to help him breathe because his chest muscles were paralyzed by polio. Since Dr. Jonas Salk developed the polio vaccine, the disease has been 99% eliminated worldwide. Vaccinations have truly improved the health of us and our dogs. So why is everybody fearful of having their dogs vaccinated? There is presently a widely believed idea that vaccination reactions are common and vaccines cause other health problems, like cancer, allergies, overstimulation of the immune system. A recent three-year Canadian study of dogs receiving vaccines found that the occurrences of vaccines reactions are actually low. The range is little as 1 dog in 3,846 for mild to moderate allergic reactions and 1 dog in 5,000,000 for injection site tumors. The other reactions that fell in these ranges included vomiting, diarrhea, pain, lethargy, autoimmune disorders, circulatory collapse and death. Despite these statistics, dog owners are avoiding having their dogs vaccinated. Why? The fears are that vaccines cause other problems like cancer and autoimmune disorders due to overstimulation of the immune system. Unfortunately, there are no studies to prove this theory. However, I think there may be some truth to this concept that we may later prove. Why? No studies have directly proved the overweight condition in dogs can cause cancer, liver disease, kidney disease, diabetes, bladder stones and arthritis but research shows strong links to these conditions and a dog’s weight. We also know that excess fat acts as a gland that produces and release 39 hormones, all of which promote inflammation. It is believed that this constant inflammation is responsible for the long-term effects that cause the conditions in overweight dogs. Research is still outstanding to see if frequent vaccination may overstimulate the immune system and create an inflammatory body environment. Are Veterinarians Vaccinating too Often? Veterinarians have done a very poor job of marketing their knowledge. They do not spend enough time explaining what they found on their physical exam of your dog, their thoughts on diagnosis and treatment, and planning prevention strategies. Consequently, owners do not see the value in their dog’s exam, and are not inclined to take their dogs to the vet unless they have a problem. 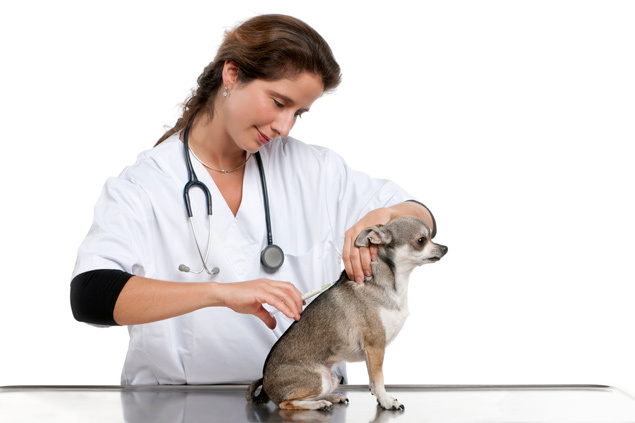 The veterinary community’s reaction to fewer vet visits is to vaccinate yearly for common diseases so you will bring your dog in for a yearly health exam. Unfortunately, this is an unhealthy strategy-dogs don’t need vaccines every year -what they do need is the examination! Protection from distemper and parvovirus last for at least 3 years and in some dogs even longer. The most a dog should be vaccinated is every 3 years, just like rabies. Better is to have your dog tested for vaccine blood titers yearly after three years and only vaccinate when they don’t have protective blood titers. We have seen dogs with protection for over 5 years. Vaccine protection is a must for your dog’s comprehensive health program, but over-vaccinating is also a real concern. The blogs this month are dedicated to Vaccine Awareness Month at The Well Dog Place, so we will be featuring information about contagious illnesses and vaccinating or non-vaccinating strategies for these conditions. Sign-up for our newsletter and receive even more information about your dog’s health. We encourage vaccine titer testing, so during June Vaccine Awareness Month we are offering 10% off all vaccine titers for your dogs. Schedule online if you like!